Eat Your Heart Out at Boston Burger Company Visitng the Boston Burger Company! Christian and I had the chance to stop in to the Boston Burger Company for dinner a few weeks ago and because we are both super smart, we started with dessert. I wanted a Freak Frappe in the worst way and I was afraid if I didn’t order my frappe first, I wouldn’t have room for it at the end of my meal. Prepare yourselves for the incredible creations you are about to see. Seriously, you’re going to want to drop everything and head there right now! I got the Nutella Freak Frappe. It’s made up of vanilla ice cream, nutella, nutella wafers and coconut. Chris got the “Churro-ly We Can Taco Bout It”. It is a dulce de leche frappe with churros, Cinnamon Toast Crunch, and a choco taco, dripping with chocolate and caramel syrup. There are new Freak Frappes every month and the “Churro-ly We Can Taco Bout It” was the May special that was so popular it was added to the menu. Of course we tried each other’s and they were both to die for. I only wish I had been able to try ALL of their Freak Frappes. But let’s get to the burgers, shall we? 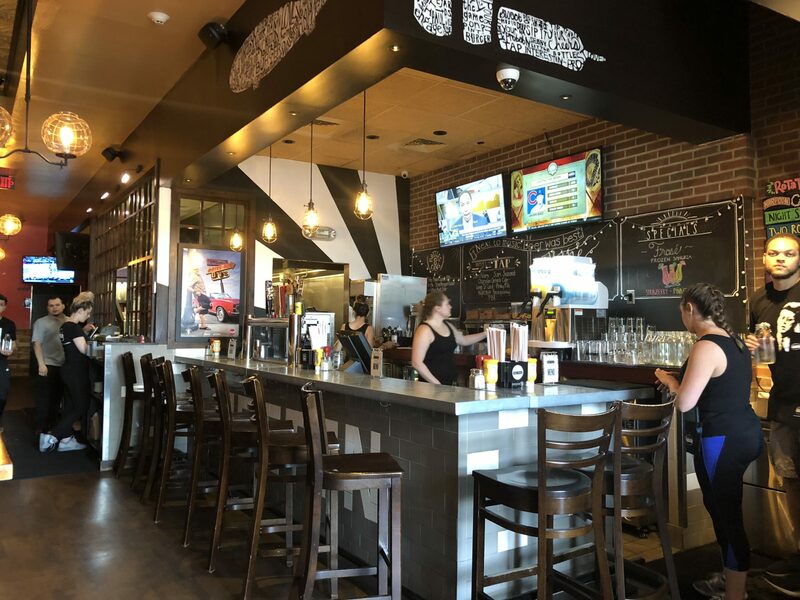 All of their burgers and sandwiches are served with homemade potato chips, and choice of baked beans or slaw. Any burger can be served as a bowl. You can also sub any burger with a turkey or veggie patty for just $1.00. Chris got the Mac Attack. The Mac Attack comes topped with homemade 4-cheese mac & cheese, bacon and it was featured on Diner’s, Drive-Ins, and Dives. I got the 420 Burger, topped with mozzarella sticks, fried mac & cheese, onion rings, fries, bacon, golden bbq sauce and american cheese. You guys! I can’t even….. The service at BBC was fast and out server was super attentive. My Diet Coke refills came faster than I could ask for one. BBC has three locations: Davis Square in Somerville, Mass Ave in Cambridge and Boylston Street in Boston. We ate at the Boylston Street location (1100 Boylston) and that location is a perfect spot to walk of your dinner. It’s right outside of the Back Bay, so it’s up the street from the Prudential Center and not far from the Boston Public Garden & the Common. As you might expect based on the location, the restaurant isn’t huge and since it’s so popular – expect to wait when you go there. In the nice weather there are seats outside, so that offers additional seating in the summertime, but it’s TOTALLY worth the wait no matter when you go. You know how you hear about a place that’s wicked hyped up, but then you get there and it doesn’t even come close to living up to the hype. Trust me, the hype about Boston Burger Company is legit! . 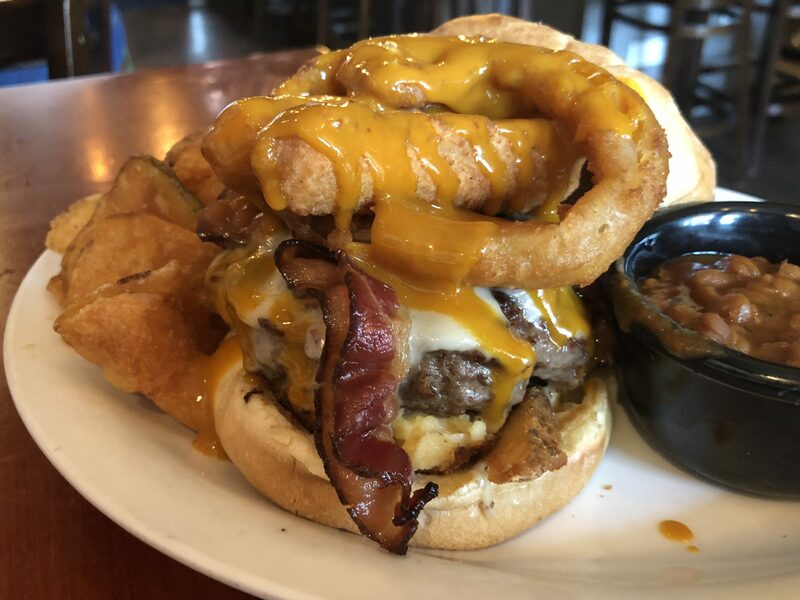 Pro tip: Make sure to go to the Boston Burger Company with a big appetite because you will be stuffed to the max by the time you walk out of there. You’re making me hungry! Those Freak Frappes look amazing and I would have the hardest time deciding which one I would order. Oh goodness, I ‘ve never had a burger with mac n cheese on it before but it looks divine. I bet I could get the kids to eat one this way. And that frappe would be so refreshing on this already hot day. OK now this sounds like an amazing place to go and get a burger – there is something about a good one that nothing can beat. Wow, those yummy looking treats and food makes my stomach growl! Haven’t been in Boston yet but I will keep this in mind if we ever visit. Was in Boston last week for a Red Sox game-Love Boston! Ate at a burger place but this one looks a lot better than the one we were at. It was such a smart idea to enjoy those frappes on an empty stomach. All the food looked so good worth a trip north for me. I wouldn’t even know how to begin to eat some of those burgers. Guess with a knife and fork because I can’t hold it and get it into my mouth. All the food looks over the top delicious. I am all about Seafood when I hit Boston, but I guess I will have to save room for some meat the next time I am out there. Those desserts look amazing! OM NOM NOM NOM!!! OMG YES to all of this! Those frappes look amazing, as does that burger. What better way to enjoy a burger than Boston Burger! Definitely adding this place to my list of places to eat, should we visit Boston. Stop it. Your first photo had me on a plane! Yum Yum Yum. I cannot wait until I can make it work to come there and we can go to all these amazing places including the BBC! Looks so good! Those burgers and frappes look fantastic, and it doesn’t look like they skimp on portions. I don’t mind starting with dessert now and again. Wow… not only does that burger look delicious but the Nutella Freak Frappe looks like an amazing dessert. I would live in that restaurant if I could! OMG, that Nutella Freak Frappe is a monster treat! Yum. Looking at that made my stomach do a happy grumble! I love Hamburgers and the Dessert looks yummy and I would love to visit this restaurant and try the food for myself. I would kill for one of those freak frappes right now…LOL!! And those burgers sound amaze as well!! Oh so yummy!! This is making me drool! The Mac Attack looks tasty! Always enjoy stopping in to places featured on Diners, Drive-Ins and Dives. Wow, that all looks super delicious! If I am ever in the Boston area, I’ll have to grab a bite to eat there for sure! Who cares about over the top milkshakes when you have frappes like this! It’s enough to pull you in and give the restaurant a try! If you really want to treat yourself, you should totally go here! I have to try the Boston Burger Company the next time I’m in Boston. The food looks amazing! My eyes went instantly to the churro milkshake. Genius I love Churros!!! Wow this place looks like my kind of restaurant! That freak frappe looks absolutely delicious. If I’m ever in town, I want to eat here!! Oh wow, who would not love to have this foods! Definitely such a great way too do on a food trip as well! Seeing these pictures makes me drool over it! The Mac Attack and the 420 Burger are insanely yummy! OMG, I don’t mind if they are a gazillion calories each. I just got to have a chance to try them! This is the kind of restaurant I wish our city had. It all looks so good!